Delhi's government announced Friday that it will install air purifiers and a mist-making device at major road intersections in the Indian capital to curb choking levels of pollution. Delhi has been shrouded in a toxic soup as residents gear up for the Hindu festival of lights, Diwali, which is marked by ear-splitting fireworks that leave days of dark smoke in its wake. 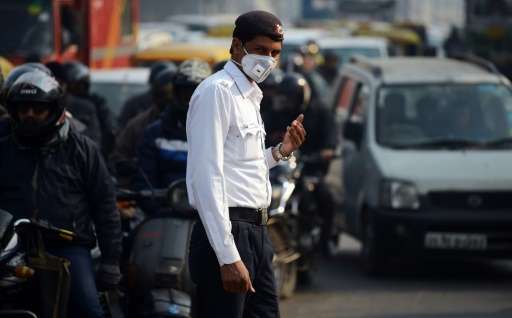 "We are planning to install air purifiers at five major intersections in Delhi to reduce pollution levels," Delhi health minister Satyendra Jain said at a press conference. "We also want to try to install a mist fountain at one of these intersections... we want to do this at the earliest, maybe within a month or two," he said, adding that the mist will "help pollutants settle". India's state-run System of Air Quality Weather Forecasting and Research showed levels of harmful PM 2.5 particles hovering between "very poor" and "severe" in the past week. These fine particles less than 2.5 micrometres in diameter are linked to higher rates of chronic bronchitis, lung cancer and heart disease as they settle into the lungs and can pass into the bloodstream. Jain urged residents not to light crackers this Diwali on Sunday, saying respiratory problems had sharply spiked in Delhi—rated as one of the world's most polluted cities in surveys. The Delhi-based Centre for Science and Environment (CSE) issued a warning on Friday on "the deadly impact" of bursting firecrackers at the onset of winter when the air is already saturated. The government also said it will convert a coal-fired power plant into a waste-to-energy one by December 2017. New Delhi's air quality has steadily worsened over the years, a consequence of rapid urbanisation that has brought pollution from diesel engines, coal-fired power plants and industrial emissions. It also suffers from atmospheric dust, burning of crop stubble in farms around the city as well as pollution from open fires lit by the urban poor to keep warm in winter or to cook food.